There are three things to note about this. First, it's important to remember that the old world of print was based on a scarcity. As such, many families only had 1-2 newspapers, which meant that all of this time (about 20-40 minutes) was often spent with just a single publication. 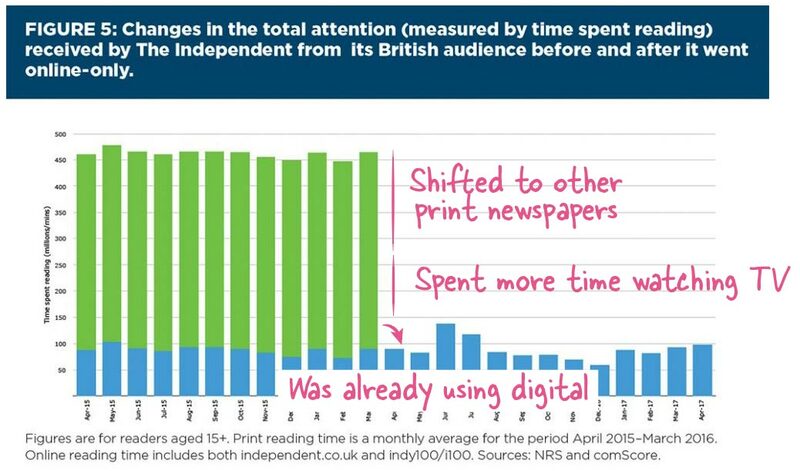 Secondly, while we say that the old print audience spent 40 minutes reading the news each day, this wasn't really what they were doing. Look at when news consumption happened. It happened when there was nothing else to do. In the print industry there is this notion that the audience was heavily engaged and attentive, but this is not actually the case. Instead, this consumption is almost entirely based on 'downtime'. It's consumption that happened after people had done their daily chores, and before the TV shows came on. This was passive, lean-back, reading without any real purpose or goal. Which leads us to the third thing. People didn't read print newspapers any different to how they read digital newspapers. Something we constantly hear from traditional publishers is that digital audiences are shallow, non-attentive, and don't spend any time reading any of the articles. But is that any different from how they read print newspapers? It was a nice newspaper, beautifully designed, with articles and ads on every page. But here is a question, how many people read that one article at the top-left on the second page ... and for how long? 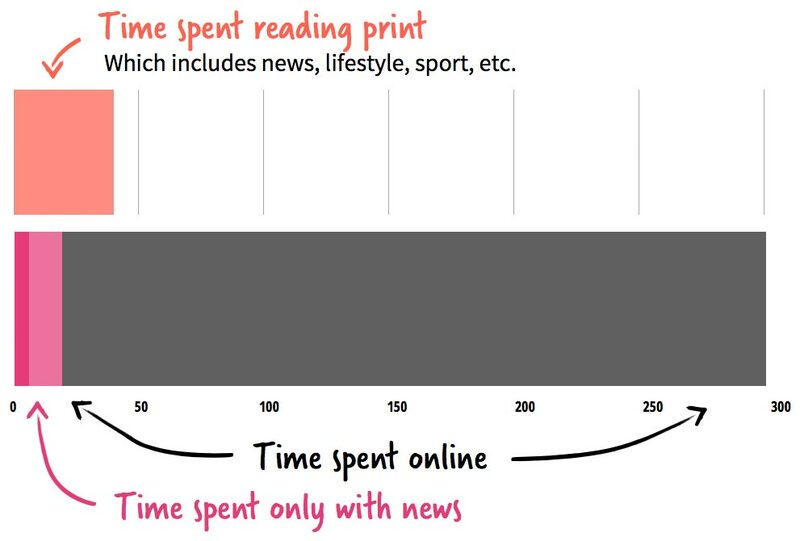 When you look at print, and you actually measure consumption per article, you see exactly the same pattern of behavior that you get in the digital world today. People would skim the headlines, flipping through the pages, with no clear intent or goal in mind. Whenever they did find something that looked interesting, they would start to read it, but often not actually read the article to the very end (very low completed-read-rate per article). And on top of that, the time spent per article was measured in seconds. The way people read print newspapers is exactly the way they read online newspapers. Online, they just look through the 'news feed' (aka flipping through the pages) and only stop for a very brief time with each thing that catches their attention. The only reason the media industry has fooled itself into believing this isn't the case, is because print (as a package of news) was consumed all in one go. This is important to remember, because most of the things we complain about in digital are actually not about digital at all, but about what type of content we create. We are designing our articles to be snacked on ... even back in the old print days. Just look at The Independent's print edition above. Every single article is just a snack. The only reason print was more valuable to publishers was because it existed in a world of scarcity that focused all the attention towards just a single publication, and with a limited usage model, where it was impractical to carry a newspaper with you everywhere you went. It was not because the audience was more valuable. So what about digital? How do they consume content online? Well, let's look at the younger audience. We know that young people spend 4.9 hours per day online, which is a massive block of time. It's so big that there is no place to really put it. This is something that the traditional media wants people to forget. 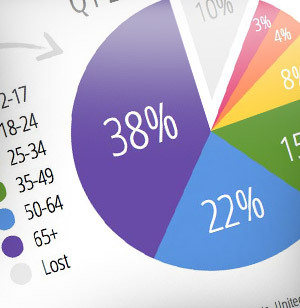 Study: National press online readers average 30 seconds per day versus 40 minutes for print. Overall some 88.5 percent of total reading time is spent in print versus 11.5 percent online. This follows a report by the News Media Association which found that the main UK national newspaper publishers made 88 percent of revenue from print versus 12 percent online. My research shows that while print newspapers are read for an average of 40 minutes per day, online visitors to the websites and 'apps' of those same newspapers spend an average of just 30 seconds per day. Are you kidding me? What kind of idiotic nonsense is this? The Press Gazette is saying that consumption is down from 40 minutes to just 30 seconds, but this is not true at all. Instead, consumption is up from 40 minutes to 294 minutes (a 635% increase in time spent). This entire study is one big lie, because they are measuring the wrong thing. 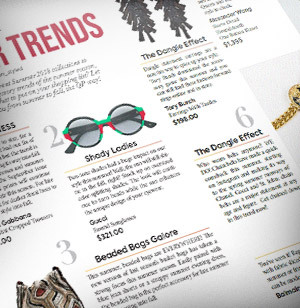 They are measuring digital consumption as if we were still living in a world of print. It's an absolutely useless way to look at this. 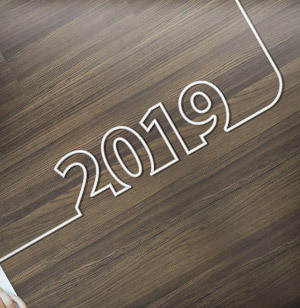 Instead of having one big block of time where people sit down with just one newspaper, people now have hundreds of moments of different lengths throughout each day, spread across several different publishers and channels. You can't compare print and digital by just looking at a single publication, because digital is an entirely new usage model. 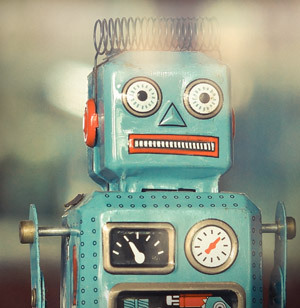 If you want to compare digital consumption, you have to compare it across all their channels. So think about what is really happening here. What the Press Gazette is reporting is that news consumption today only represents 1/10th of one of the lines above (30 seconds), but that's just for one publication. 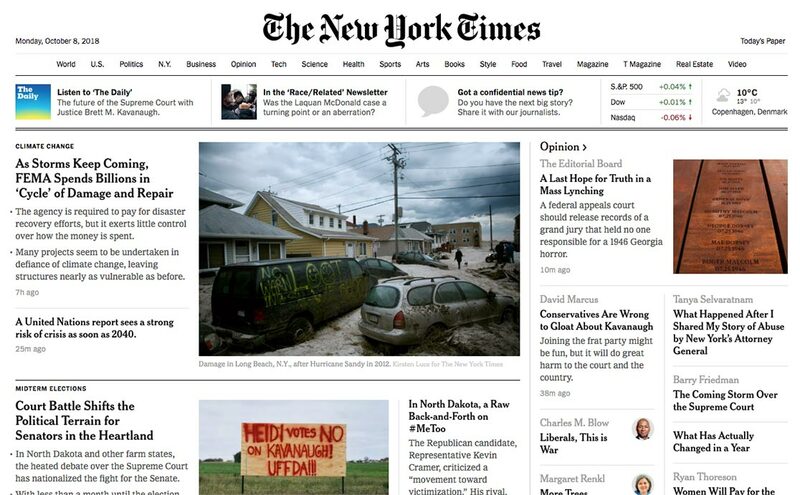 What if we look across publications? Well, here we have a bit of a problem, because nobody can really agree on how to measure this. You will notice it says that people spend between 13 to 38 minutes watching news on TV, which is much less than the 3.5 hours of TV people watch each day. It's the same with print, which here is listed as being between 2 and 5 minutes per day, which, again, is much less than the 40 minutes reported by Press Gazette. 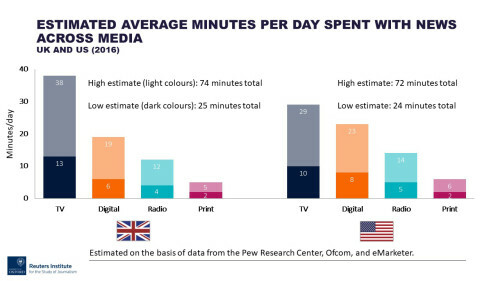 So this is only looking at a subset of the total consumption, but even with that, digital news consumption is listed as being between 6-19 minutes per day... which is a lot more than 30 seconds. 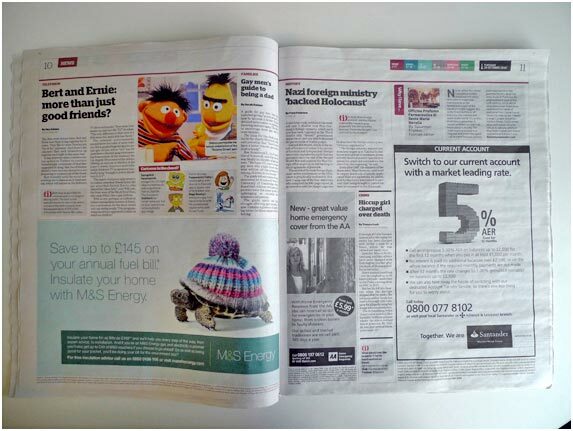 This is a more accurate way to illustrate the difference between print and digital. In print we had 40 minutes of consumption per day, to all parts of the newspaper (not just the news, but also all the other sections). In digital, the news part has now been reduced to anywhere between 6-19 minutes, but that's only for the part considered to be news. The rest has massively increased... which includes all the news that journalists don't think of as news. The problem is that the media has massively narrowed the definition of news. In the past, almost everything was considered to be news (just look at how we measured print), but today, news is only the things you see on the front page of a newspaper. Stories about political issues, crime, corruption, or similar. And when the media industry talks about news today, we are really only talking about a very small subset of what news is really all about. Take something like Facebook. Only about 4% of people's News Feed is categorized as news, but to the individual most of the content is 'news to them'. One example, my niece recently won a gold medal in mountain biking, which she shared on Facebook. Is that news? Well, probably not to you, nor to a mass-market. But to me, since she is my niece, this is definitely news. In fact, it's a more relevant form of news than most of the 'real news' stories that I can find in the press. It's the same thing when it comes to a lot of professions. If you are a doctor, how many articles in the newspapers relate to your profession? Almost none. If you are a car mechanic, how many news stories relate to that? Again, almost none. If you are a botanist, how many stories...? Again, none. Even as a media analyst, there is pretty much never any news in newspapers that has any use to me in relation to my work. Now try to imagine any type of profession, any type of hobby or personal passion, and ask yourself how many of these articles relate to that? Mind you, I'm not saying that the news the New York Times reports isn't important. It is very important, especially today with the issues facing the US (and other parts of the world). But what I am saying is that this news represents a smaller and smaller share of people's total media attention. When young people today are spending 4.9 hours on media, only about 6% of that time is spent on this type of news ... but that's still 6-19 minutes per day only reading 'hard news'. The reality is that the newspapers of today simply no longer represent the media world as a whole. Today we have a very different world. This is not just the case with news. It's also the case when it comes to monetization. When people today are asked to spend money on media, people generally have a fixed budget that they feel they can afford to spend on this. In my country (Denmark), the average for this is $1,175/year. Obviously, other countries might have different numbers, but I'm going to use this as an example. Note: One of my readers asked me about 'media subsidization', but that is included in the above numbers. 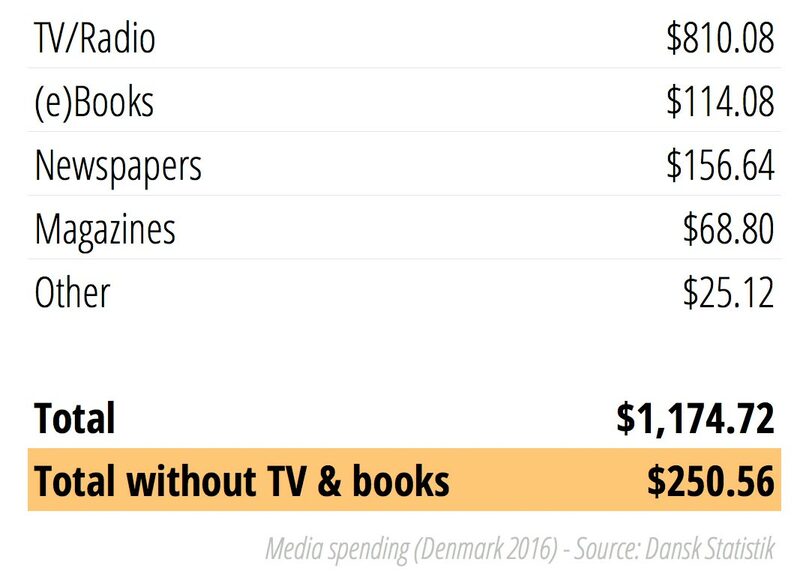 About $100/person is added to the 'TV' category for subsidizing Danish Broadcasting Corporation (our version of the BBC), and another $10/person is added to 'newspapers' for the subsidization they recieve. There are a lot of discussions in Denmark about whether those $100 are fair or could be used differently, but that's an entirely different discussion. But think about these numbers. In the early days, choosing how to spend this was fairly simple because of how limited your options were. But in the digital world it's suddenly a lot harder. People are still willing to spend the same amount of money, but today there are just too many things that are trying to get our attention. Just take something simple. For a young person watching YouTube, most popular channels now end their videos by asking people to pay them in some fashion (like via Patreon). Or take something like a fitness magazine. If you wanted to subscribe to a fitness magazine in the past, it was simply a matter of picking one of the 3-4 magazines available at the newsstand in your country. But in the digital world there are thousands of options ... most of which aren't just a magazine. For instance, if you are interested in yoga, you can either subscribe to a traditional magazine (which is usually not that good because they are just posting random articles optimized for Facebook), or you can go to the 100s of bloggers/YouTubers who are also offering some form of paid-for training. Our concept of what is media has massively expanded. In the past, it was just newspapers and magazines, but we have services, apps, games, and so many other things ... and each of these is a choice, both in terms of time and in terms of what you are spending your money on. So, suddenly we have this amazing level of demand on people to figure out how they are going to spend their media budgets. And the outcome of this is quite disastrous for newspapers. If people are willing to spend a total $1,175 on media, but only 6% of their time is spent on news, this gives us a theoretical revenue of $70/year across all the hard news sources to share. Compare this to the cost of subscribing to a newspaper. In my country, 'Berlingske' (one of our national newspapers) costs 99 DKK/month ($16/month) for the digital edition and a staggering 549 DKK/month ($85/month) for the all week print edition. How many people do you actually think would be willing to spend 87% of their total media budget on just one newspaper? Even at the digital only price range, we are still talking about $192/year. That's more than people are willing to spend on newspapers on average even before we start to consider the abundance of choices. Basically, you are asking people to focus only on you, when you only represent 6% of their time, and mostly this doesn't work. So, what we see today is that people are generally very unwilling to spend all their money on just one thing. Instead, they will spend a little bit on one thing and a little bit on another thing. What people are also doing is skipping the expensive cable TV packages. 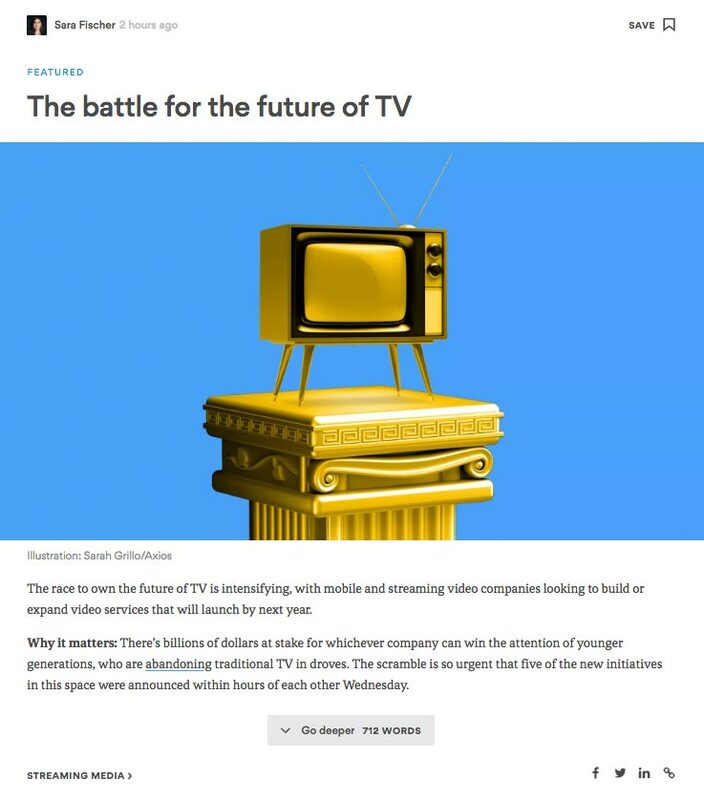 So instead of spending $810 for TV, they get Netflix for $192 and $120 for YouTube Premium, and then maybe another $100 for some other specialized channel (like their favorite sports app), which totals $412/year ... or half what they could spend on cable TV. This means that they have that much more money to spend on other forms of media, so they support a bunch of YouTubers on Patreon (with $5/month ... $60/year) and a bunch of other things. This is the new reality. It's not that people aren't willing to pay, it's that people are not willing to put all their money into one publisher, and that you have to dramatically up your game in terms of giving people a reason to pick what you have to offer. The classic model, especially for newspapers, where you just create a package with a little bit of everything, mostly focusing on the type of news that isn't personally relevant, and then ask people to use their entire news budget on just that one thing, simply doesn't work anymore. And we see the effect of this in the market. When we look at how newspapers are gaining subscribers, we see that they are basically only reaching 2-5% of their audiences. In other words, you are either only reaching those who still have a traditional media consumption pattern; or only those who are rich enough to be able to afford to pay the traditional prices; and/or those who are politically motivated to focus their media spending on political news. This is what we see in the digital market. For the 95% of the audience that you have, you are simply not specific or focused enough to get picked and to be paid for. When I start to talk about this, people are quick to point out that it's 'because of Facebook', and if it wasn't for that, the media industry would be just fine. But is that true? Well, let's take a look at that. The blue lines are all the time that people spend, per day, on Facebook. The orange lines are how much time people are on other social channels, and, of course, the pink lines are the remaining time people spend on non-social channels. What I have also mapped out is how much time people spend on Facebook reading hard news, which, according to Facebook, is only 4% of people's News Feeds, meaning that it's just half of one of these lines. This is how small a share of people's time is spent reading news on Facebook. It's like nothing. So blaming Facebook for stealing your traffic seems pretty far off, because that's not really what Facebook is doing. The amount of time that Facebook 'steals' from newspapers is like 1% of the total time people spend online each day. What we also know is that when we look at how this traffic behaves, it's much less valuable. For instance, when a Danish media site decided to stop using Facebook for three weeks, they found that "People spent 42% more time reading their articles, and read 12% more per session". But, you say, studies like this one from PEW have found that about two-thirds of Americans get their news via social media (mostly Facebook). Okay, but if that's just 1% of people's total time spent, does that really matter? Well, let me show you something. 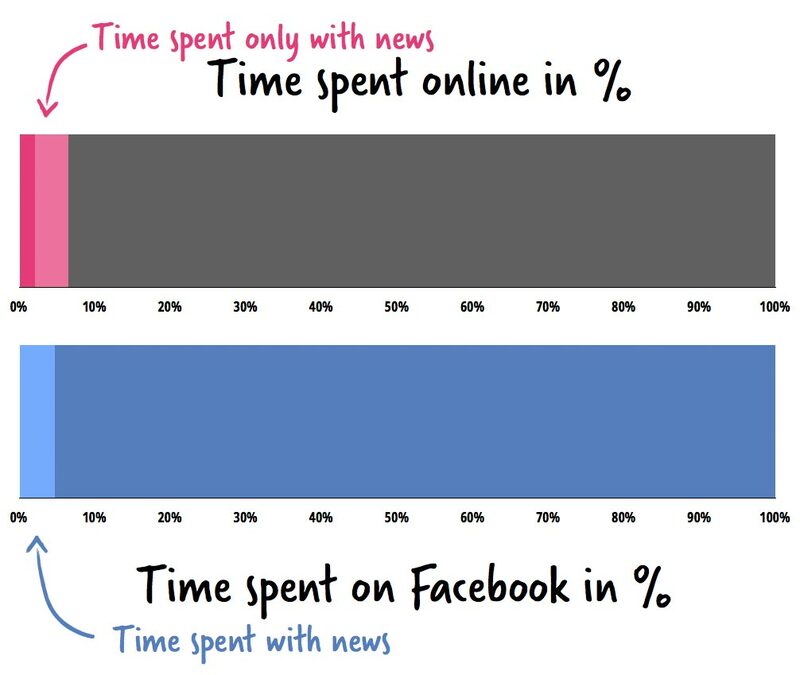 If we look at the total time spent online and what share of that is news, we see that it's between 2 and 5%. And when we look at Facebook, we now also know that only 4% of the News Feed is about news. What Facebook is doing is merely reflecting the trends that are already in the market. When they are optimizing for maximum engagement, the reality is that people simply don't care that much about the news we write. Again, this doesn't mean that the news isn't important. It is. But in terms of personal value and time-management, asking people to spend more than 4% of their time (on any channel) reading about Trump is not really something people want to do. The problem isn't about Facebook. It's about us, and the type of news that we focus on. This is the real problem. 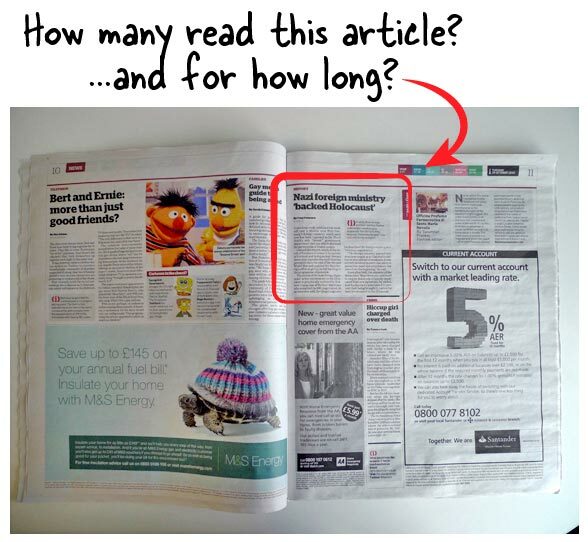 We got fooled by the scarcity of print, into thinking that people wanted to read about random news. But in reality, the type of news that we created, even back in the print days, wasn't really what people wanted. Because they had nothing else to do after work (and before the evening's TV came on), they spent 40 minutes reading it anyway. 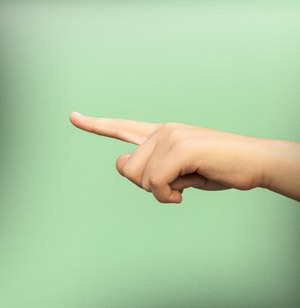 Now that people have many more options available to them, they are shifting their attention to other things. Things that we as newspapers don't do very well. The simple (but painful) reality is that we have become a lesser choice. And we need to change this. The first step to changing this is to realize that creating one big package of news is a very bad idea. It's bad because you can't ask people to pay a high enough price for it to really be profitable (at least not anywhere near as profitable as with print), because people are not going to spend all their money in one place. But, wait a minute, you say, couldn't we solve this by creating a 'Spotify for News' model, where people can pay one big sum of money and then not have to choose? Well, from a reader perspective, yes... that might kind of work. But from a publisher perspective it's the worst idea ever. I wrote a much longer article about that last year. But in short, what a Spotify for News model does is that it reduces the overall revenue (a subscription like that would be something like $9.99/month), and this money will have to be shared with both the platform and all the hundreds of publishers in it. The result is that, per publisher, you are going to make a tiny amount of money per subscriber. If people are spending $9.99/month, and there are 500 publishers sharing that revenue, that's 2 cents per person, per month. Even with scale, this has a terrible revenue projection. So, instead you have to focus on getting picked. You have to find a way to get people to pay you more than what they are willing to pay for other things. And there are several ways this can be done. The first way is just to embrace this trend. If we know that people are struggling to find the time for all of these different choices they now have, one simple way to help is to make news more efficient. Instead of trying to get people to spend even more time reading about news, why don't you try to increase the value of the 6%? So, if you know that people are going to only spend 15 minutes per day reading about hard news, what product could you create to make that time as valuable and as efficient as possible? Well, in my article about curation, I wrote about just that. 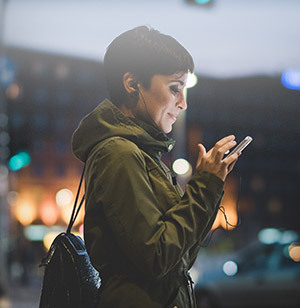 Many of the new services aren't based on just filling people's time with news, but are redefining the format of news into something far more efficient. One example is a news site like Axios, which isn't trying to give you a constant stream of news, as if the world was just a big reality show. 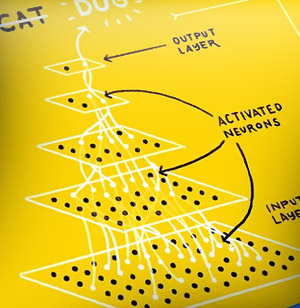 They are producing extremely to the point articles that tell you what you need to know in as focused and fast a way as possible. Compare this to what you see in traditional newspapers. It's an entirely different form of value. So, as a publisher, could you maximize this value so much that people would come to you as a destination, rather than just being another random link on Facebook? Another way to approach this is to focus on the time spent and how you can increase that. To do this, you have to create something that is worth spending time on. 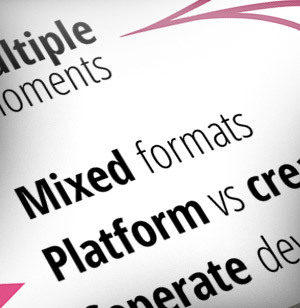 In other words, you have to change your format from being low-intent micro-moments, to high-intent macro-moments. The challenge here is that the only real way to do this is to either focus on creating something that is entertaining, or to create something that is actionable. Most traditional publishers do neither. Being entertaining, for instance, is something we see all the time on YouTube. Here is a video where Adam Savage is building the 'Overlook Hotel Maze Model' from Stanley Kubrick's movie 'The Shining'. This video is 24 minutes long and has been viewed 3 million times. This is content that is designed to increase the 'time spent'. Of course, there are many other ways to do this, but one thing many traditional publishers miss is that there is lots of truly amazing content that young people choose to spend a lot of time on, but it's almost never being created by traditional publishers. The second way is to create something that is actionable. Most traditional publishers are defined around just 'reporting things', which means your editorial strategy is to act like passive bystanders just telling people what is happening. This can be very important for some things, but in terms of time spent and, more so, in terms of what is worth paying for, you are not creating any content that is worth investing in. Let me give you an example. Imagine a charity wanted to raise money, but the only thing they did was to tell you what happened somewhere. 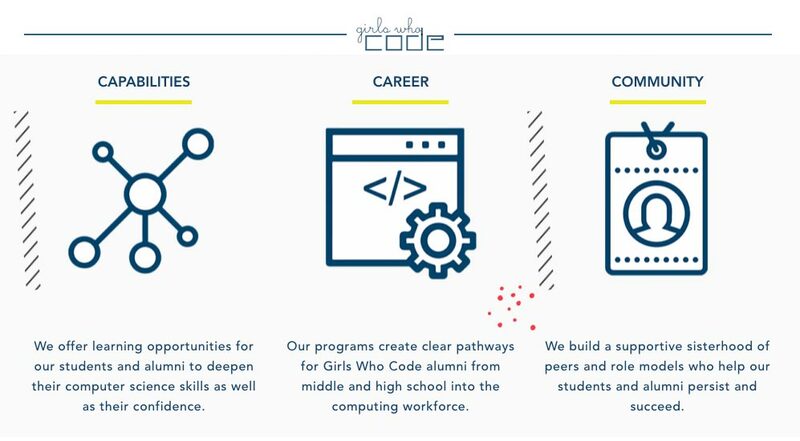 Take a charity like Girls who Code, which is an amazing organization that helps girls become engineers and entrepreneurs. Imagine if all they did was just write blog posts about this, would you spend time with that? Would you pay for it? But because Girls who Code is primarily focusing on trying to solve a problem and helping girls in an active way, they suddenly become far more valuable. They embed themselves into your life, because they are helping you find a solution. This is far more valuable. As a publisher, you need to think about your role in the same way. Are you just reporting things, or are you part of the group trying to find a solution to something? The simplest example that I always use is to look at a fitness magazine. If all you do is report about fitness, you are not really that valuable, because there are thousands of sites online that just report on things. But if you focused on helping people get fit, via training, via specific activities, via member support groups, via expert connections, you suddenly change your role from just being yet another publisher, to becoming a high-intent macro-moment. So, if you want to increase the time people spend with you, you need to do either of these two things. The worst thing you can do is to just focus on the low-intent micro-moments of Facebook traffic that are generally just trending downwards. A third way to change the time people spend with you is to dramatically change the way you define relevance. We are not talking about just being 5% more relevant. We are talking about a completely different approach not just to how you do things, but also what you focus on. As I mentioned earlier, one of the fundamental problems with news today is that most articles have no personal relevance. Again, this doesn't mean that it's not important (it often is), but for most people, it has zero influence on their personal existence (with some exceptions). What we have here is an editorial tool that I have sometimes used with my clients to illustrate the value of their articles. So, let's do a little experiment. I will now go to The Guardian (it could be any newspaper) and see what types of news stories they are featuring on their front page. Obviously, someone being tortured isn't a good thing and shouldn't happen, but think about this in terms of the circles above. 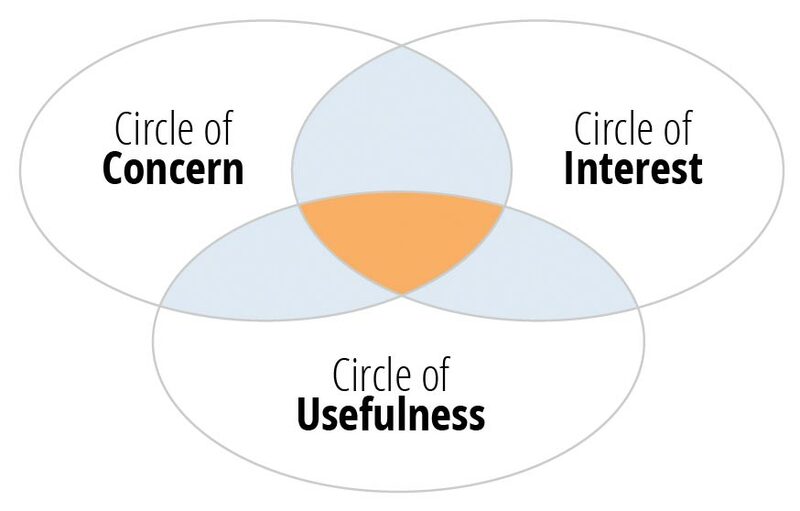 Let's first take 'circle of interest'. Am I interested in this? Don't get me wrong. I'm not okay with this. I don't think this is acceptable. But an 'interest' means this is something I would want to spend my time on... and I don't want to spend time on this. An interest is something that gives you joy, and there is no joy here. Then we have 'circle of concern'. Am I concerned about this? Well... kind of. As I said, I don't think that something like this is acceptable, and I do think it's wrong that it is happening. But it's not a personal concern, it's more like an abstract concern. 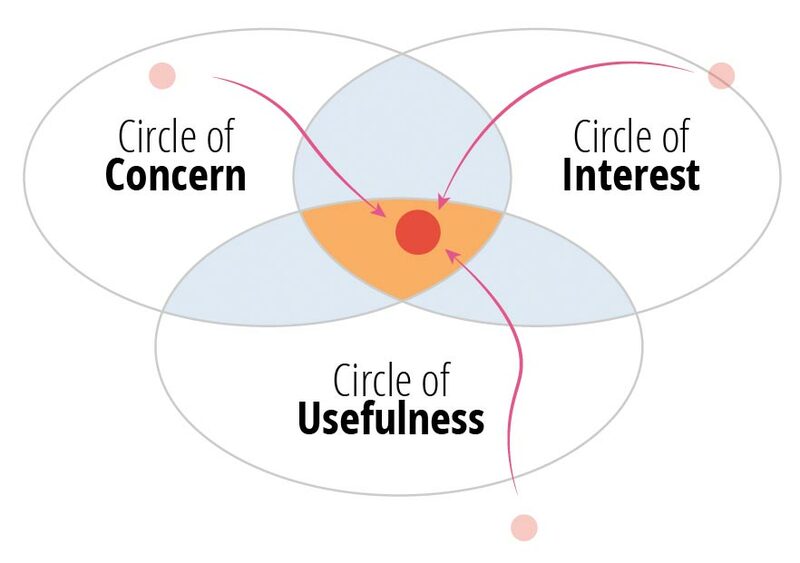 Then we have 'circle of usefulness'. Is this useful to me in any way? And again, the answer is just flat out no. 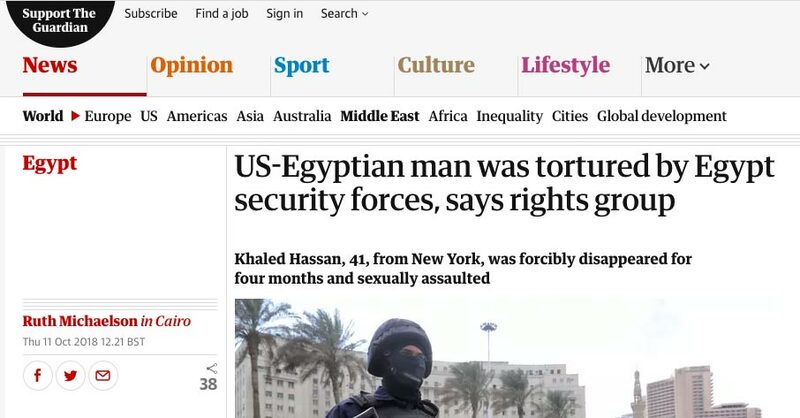 There is nothing I can do with this article... except perhaps not travel to Egypt as a tourist (which is not the way you should approach this). So... no. This article has zero use for me personally. I'm slightly concerned about it, but there is nothing I can do with this. I can't turn any of this into action. This article, like many others, exists at the very far edge of creating any form of personal value or relevance. Again, it doesn't mean it's not important. But if you ask why people only spend 15 minutes reading news each day, this is it. So the question you need to ask yourself is: What can you do to change this? In other words, how can you change your editorial focus so that your future articles will be ranked more like this? 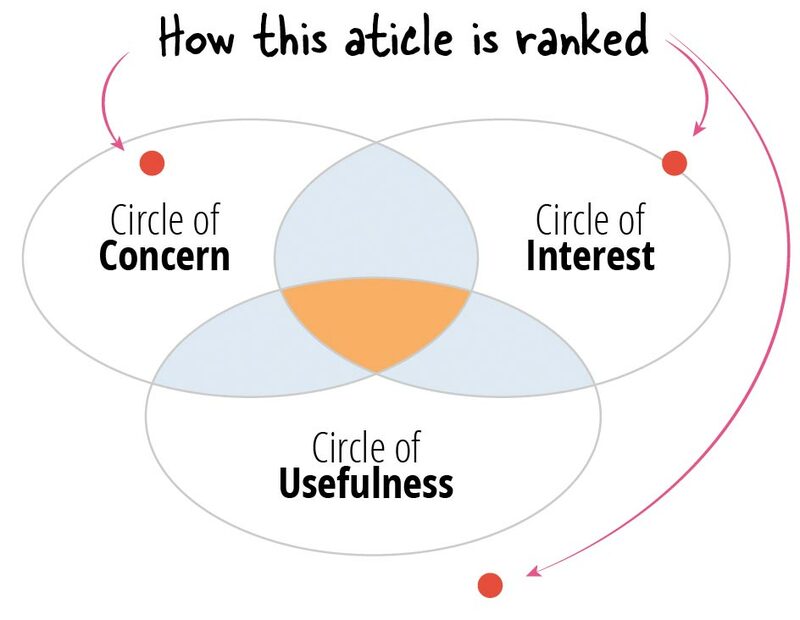 Mind you, every article doesn't have to be 100% within each of these circles. You can have things that are of true interest to people, but aren't about anything that is of concern to them. In this case, you have to maximize the depth of how you talk about it, so that people can spend a lot of time on it. 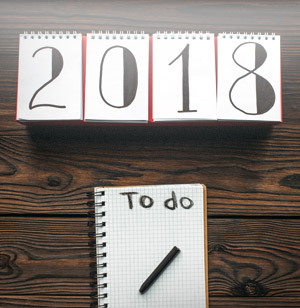 Or you might have something that is really important for people's work, and thus requires a very high level of usefulness, but it may also be something people don't want to spend time on, like accounting, so here the goal is to maximize the efficiency. Same thing with issues of a really high level of concern. In this case, the best thing you can do is to say "we will take care of it" so that people don't have to worry about it. And the worst thing you can do is to focus on why it is a concern so that it fills up people's lives and makes them depressed. This is an entirely different way to think about your role as a publisher. You are not just publishing articles, you now have a different purpose. This is the new reality of digital. If you don't do anything, you become the lesser choice and you end up with an audience that doesn't really care, where only 2% of your audience choose to pay for what you do, and where the total time spent is only 6% of their time. All of this brings me back to this graph that started it all. So, what really happened here? Note - About half of the print buying audience turned up in other newspapers - they were print loyal rather than Indy loyal. Half disappeared so main point still stands.. 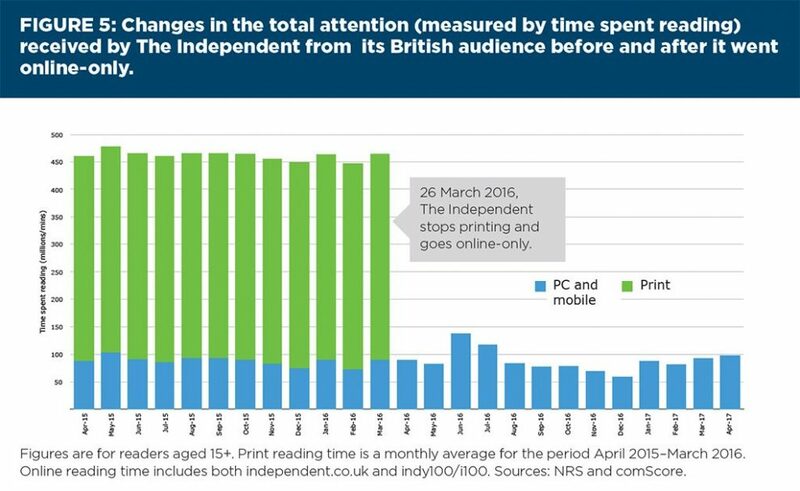 This should not come as a surprise to anyone, because old print readers have very strong habits around print, and are reluctant to change. So, obviously, they would focus on finding another way to continue what they have always done. Okay... but what about the other half? Well, remember what I said about how much of the print consumption is people filling in the time in the late afternoon? What else can they do with that time? One obvious answer is that they are likely to just spend even more time watching TV. In fact, we can see this from other studies. 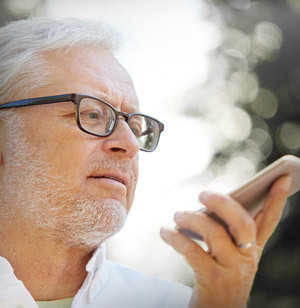 The older generation is actually spending more and more time watching TV, while the younger audience is dramatically reducing their TV time to have more time for online. 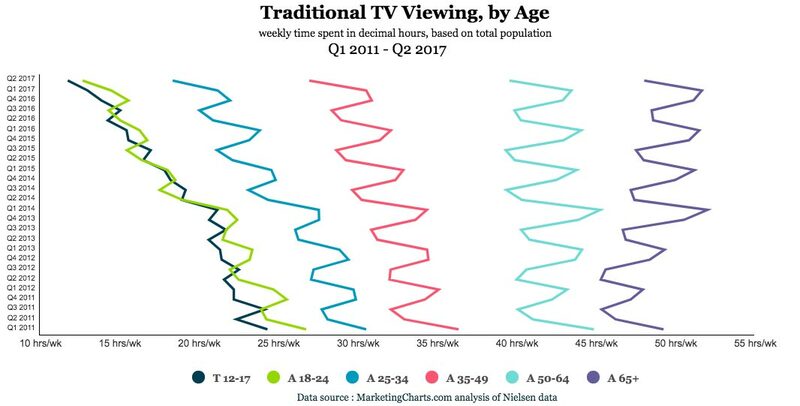 So, for some of the older viewers, instead of shifting to another print newspaper, they simply shifted to watching more TV. What's left is the group who didn't shift to other print newspapers nor to more TV. The people who used to subscribe to print, but also had a digital habit. What did they do? Well, it's simple. They did all of the things I have described in this article, but more importantly, they were already doing it. In other words, when print went away, they were already part of the digital group ... so no extra is gained. But none of this is really important, because it doesn't really matter what happened to this print audience. What's important is that we look at how people behave today. What will the next generation do? How will they interact with us? If you just continue to define news coverage the way you have always done, you will be reduced to only 6% of people's time (and currently trending downwards). So, what will you do to change that?